Woah - check your good boy out! Stylin' and keepin' warm - a double hitter! This cozy canine coat features quilted stitching along with reflective trim to keep Fido visible when it starts to get dark. The opening at the top makes it easy to attach your dog's leash to his harness or collar underneath the jacket - no getting tangled in a mess of leashes and lead lines! The jacket's stretchy top neck collar allows for added canine coverage to keep your dog's neck warm, and velcro attachments mean that this coat can be whipped on and off in just a few seconds! 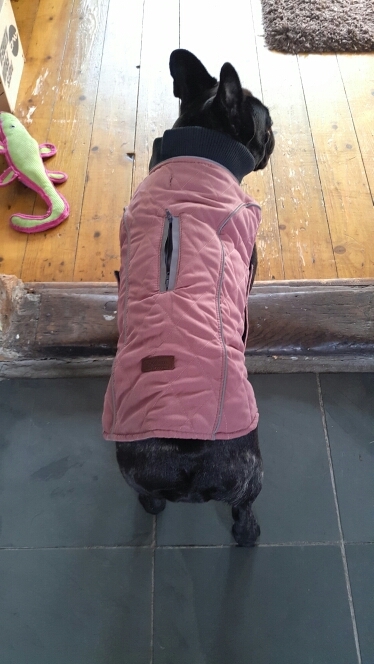 We also love that the material along the belly portion has some elasticity (an unusual feature), allowing for slight jacket adjustments depending on your dog's size. This coat comes in several sizes and colors too! Sizes: XS / S / M / L / XL / XXL / XXXL (see sizing details below) Please measure your dog before selecting a size! Note: We're able to offer this product at a great price (and with free shipping) due in part to longer shipping times. Allow 2-3 weeks for delivery (although many times it may arrive sooner)! XS 10.6" 13.4" - 15" 11.8"
S 12.6" 15.7" - 20.5" 14.2"
M 14.2" 19.7" - 22.8" 15.7"
L 15.7" 21.3" - 25.2" 16.5"
XL 17.3" 24.4" - 27.6" 19"
XXL 19" 26" - 31.5" 19.7"
XXXL 24" 30" - 35.4" 25.2"
Our vet told us to get a coat for our little dog (she has allergies and is not supposed to get wet). 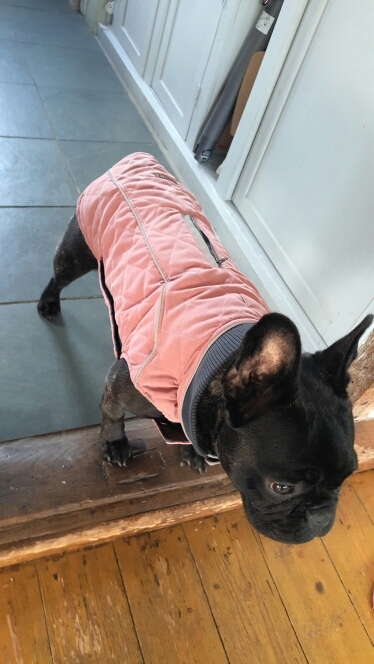 The coat is so well made and covers her belly too, that I decided to order one for my bigger dog. Easy to put on too. Love these coats! This little jacket was very well made. I was surprised! I know my puppy will have a warm winter. 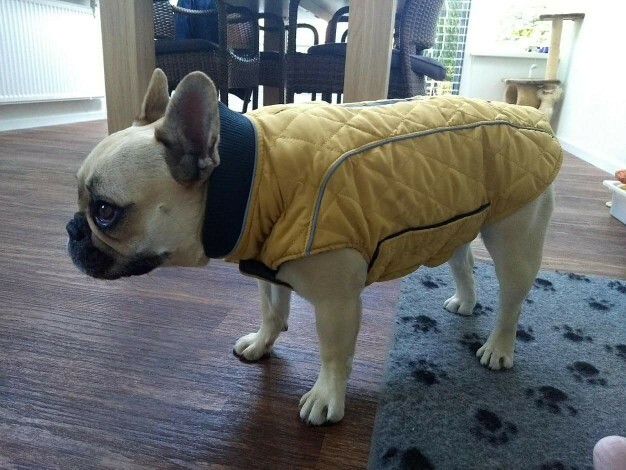 The French bulldog looks great! Excellent jacket, high quality, I am very happy! Measured with the chart, sizing is accurate. Thank you very much!